I have had a busy couple of days in the mountains completing 3 routes in 26 hours, two of which were new to me and two of them I led the whole route. 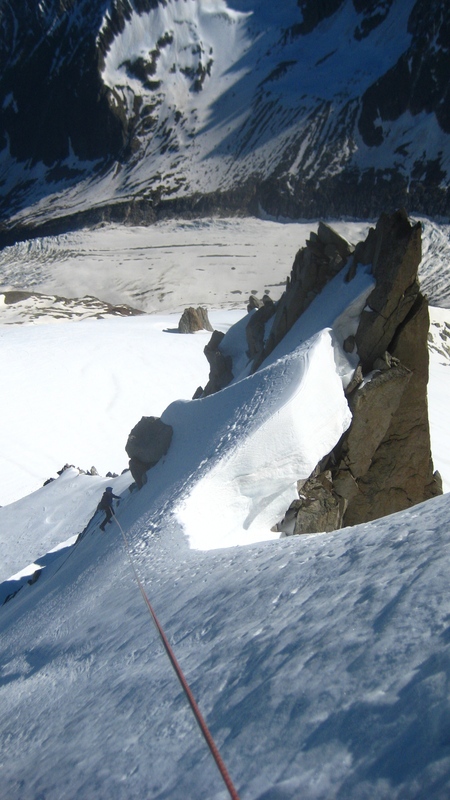 It all started at 7:30 at Grand Montet lift meeting John Vincent with our skis to go and climb and ski Petit Aiguille Vert, I have looked at this route many times when skiing top ticket and never got round to climbing or skiing it. As it was the first of July we thought it would be a novelty to go ski off the lifts, and seeing that you can almost ski to the mid station we were both excited. 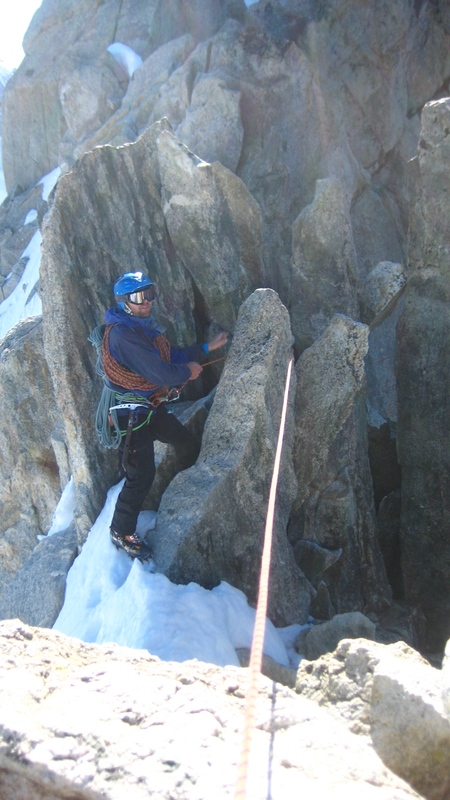 The route goes up the west ridge to the summit and is a good fun route. We didn’t take skins as it is an easy 30 minute walk to the start of the climbing. Our rack consisted of a sling which we used once, it is a very safe and easy route with lots of spines to use as runners. We were at the top within the hour and the views are amazing. 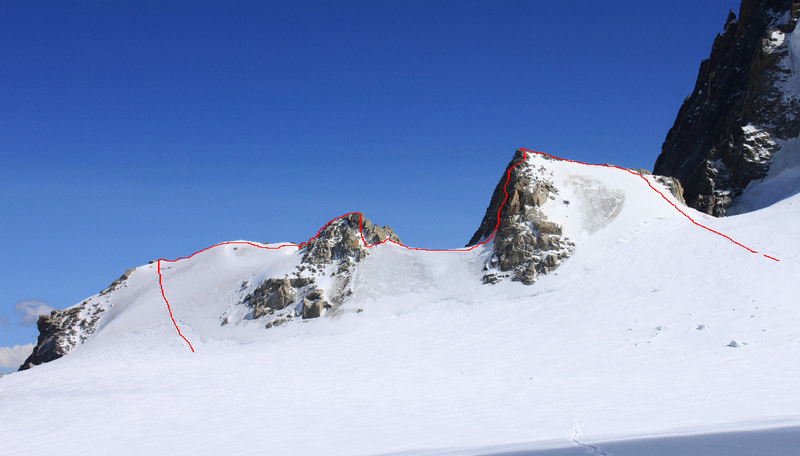 There are a couple of bolts for the rappel and you go down the opposite ridge you came up, with 3 rapps we were over the Bergschrund and back at our skis, we left them half way up as the snow was too hard to have any fun skiing! Once back at our skis we waited at the top station for Graham and when he arrived we headed down the front face on some very hard July snow. It did soften in places to some nice corn but it was like riding a big groomer and was good fun especially for the 1st of July! We were back home by 11am and I was already packing for my next route. 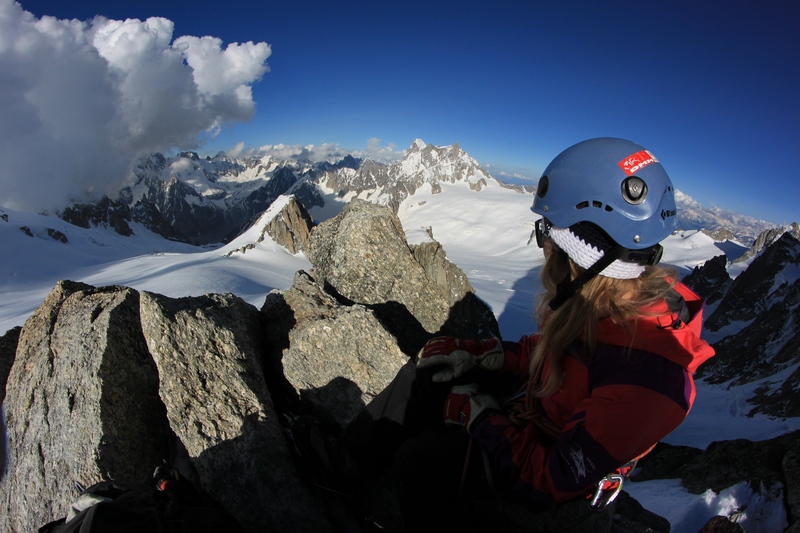 I was taking my Girlfriend Katariina on her first alpine adventure and we were aiming to do the Point Lachenal Traverse then sleeping up high then doing the Cosmiques arete first thing in the morning so we had it to ourselves. 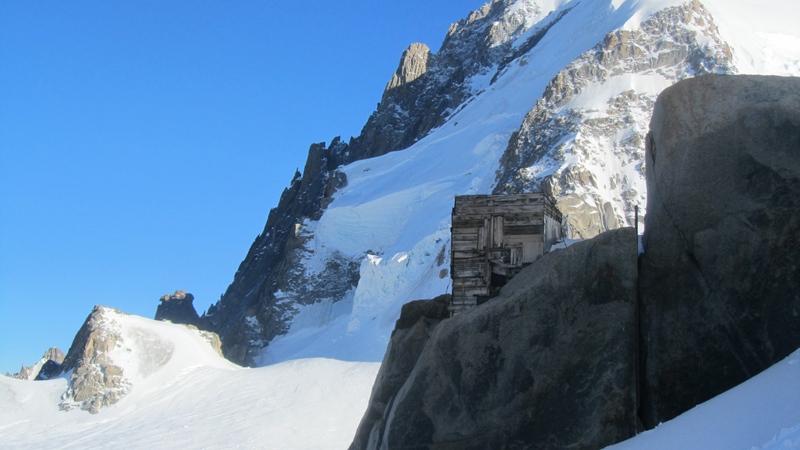 We were on the Aiguille du Midi lift by 2pm and heading down to our bivi spot the Perroux hut. Katsu looking excited on the way to the bivi, with a heavy pack on, with lots of food and water and a sleeping bag. 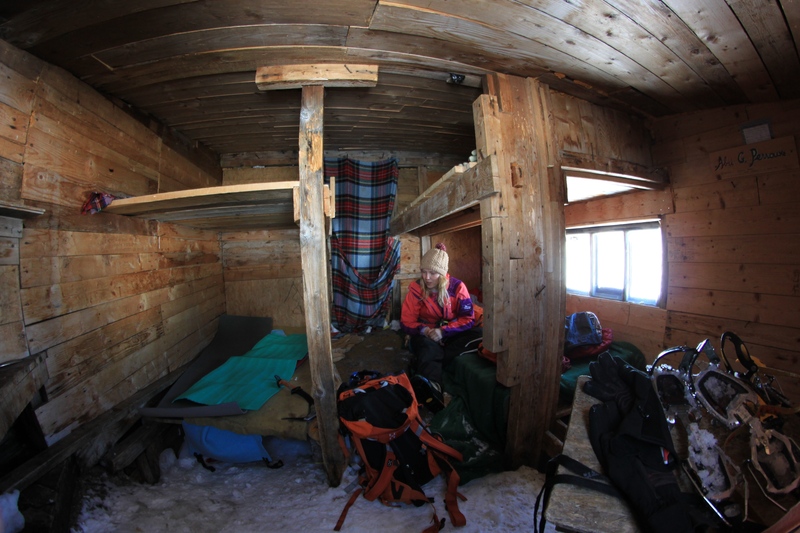 The hut is a lot nicer than sleeping in a tent and you have less weight to carry, to access it you can climb the very sketchy ladder or down climb from the cosmiques refuge. We also got there first so bagged the window beds with amazing views over the col du midi and all those in tents! We unpacked our overnight gear and got ready to take on that evenings route, The Point Lachenal Traverse, This is a nice easy route that can be done in less than 3 hours from hut to hut. We went light with only me having a pack on with both our gear in, so Katsu could enjoy here first alpine route with no extra weight. 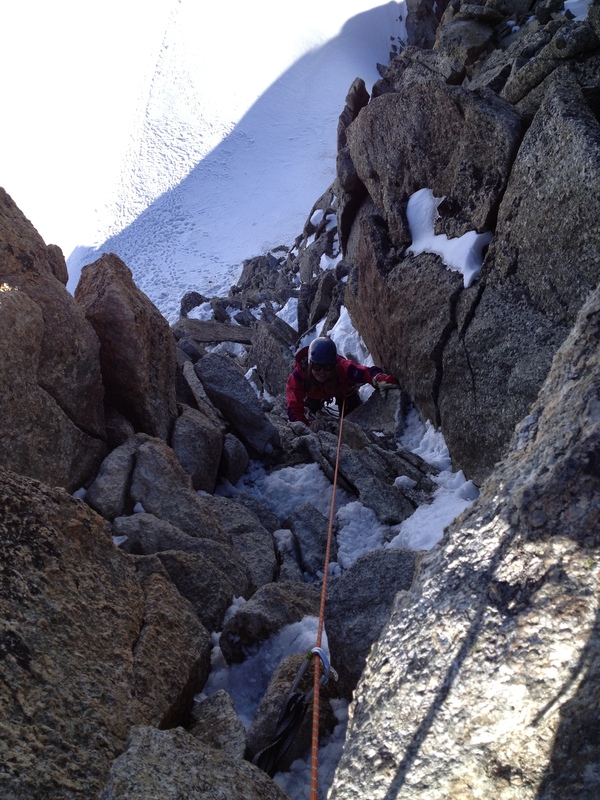 Leaving the hut/shed was good fun with a 30m hanging rappel down to the snow bank. It is a short 30 minute approach to the route which was nice as we were heading towards it in the cool evening light at about 5pm, not often you start a route at this time but as we were close to the hut and it was a short one we could do it with plenty of day light to spare. 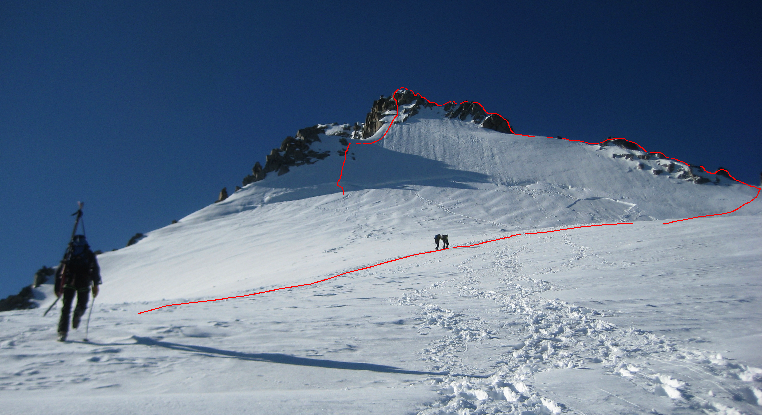 The route starts up the left hand ridge and follows the ridge towards the Tacul Triangle, there is a snow ridge followed by a small scramble then a short 20m rappel before you cross the second snow ridge which was more exposed. On the first snow ridge up to the first scramble. Katsu on the first 20m rappel. 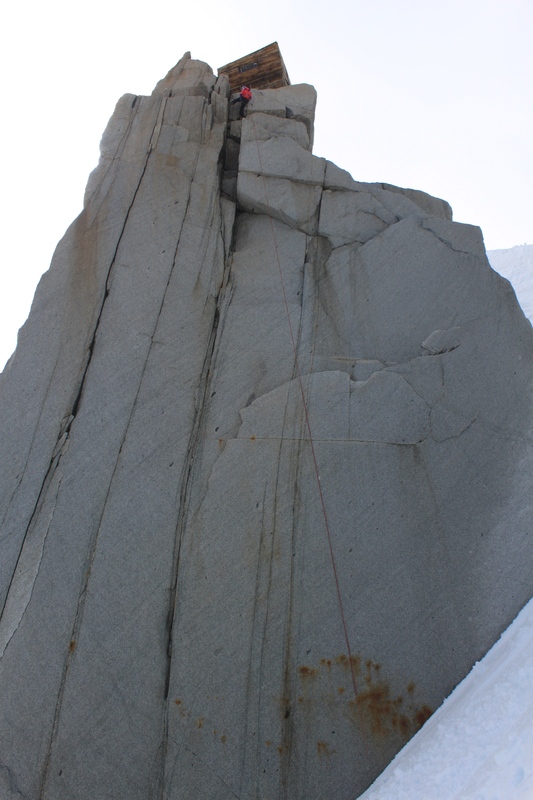 After the second exposed snow ridge you come to the best part of the route, the 45m steep chimny (4a). 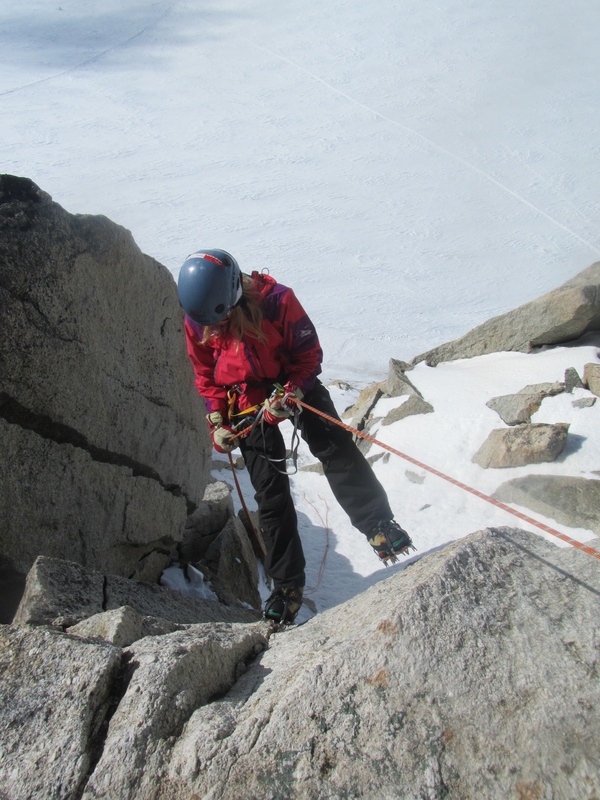 This was Katsu’s first experience of alpine mixed climbing and coming up second she nailed it, she seemed less phased than I did! You can pretty much pick any route you want as there were foot steps leading to it all, we chose one which looked challenging but also fun! Katsu coming up the mixed chimny. 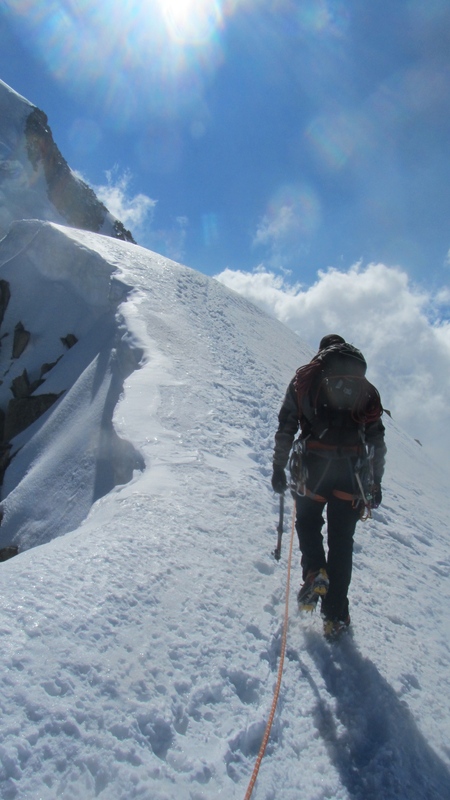 After climbing the chimny you come to the final summit slopes and a short scramble to the summit. Katariina relaxing on the summit after completing her first alpine route, a nice downhill 30 minute walk back to the hut from here and a chance to eat some food! Upon returning to the hut we could hear some voices and realised we were not going to have it to ourselves, just as we got there a couple of my friends poked their heads out and I was glad that I knew them as it is very cosy in there! With Alex and Francis in the hut it got very hot, even though it can sleep 8/12 people with just us 4 in I was down to my boxers with my sleeping bag half open, its not very often you can sleep like this at 3500m with a felt blanket as a doorway separating you from the alpine cold wind! We had our ravioli and were in bed by 10:30 as those boys were up at 2:30 for their route. Waking at this time also gave me a chance to get some night time photos and make bringing my fairly heavy dslr up here worth it! 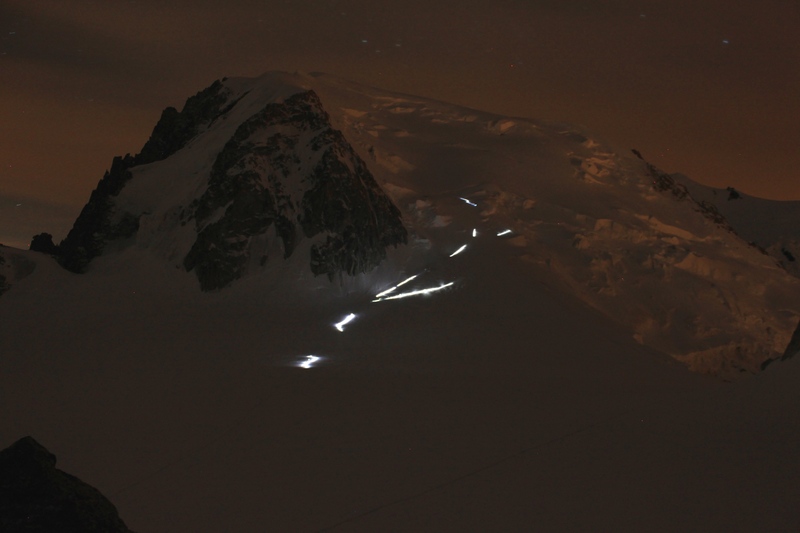 Looking out of the hut door at Mont Blanc du Tacul and the mountaineers heading up for Mont Blanc at 2am. 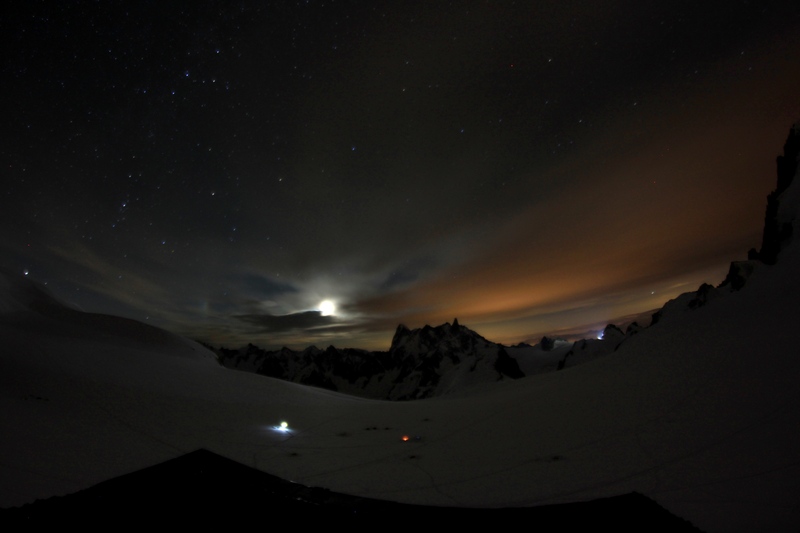 From the roof of the Hut looking across the Vallee Blanche towards the Grand Jorasses. After seeing the boys off at 2am we went back to bed for a few hours and woke at 6:45am. 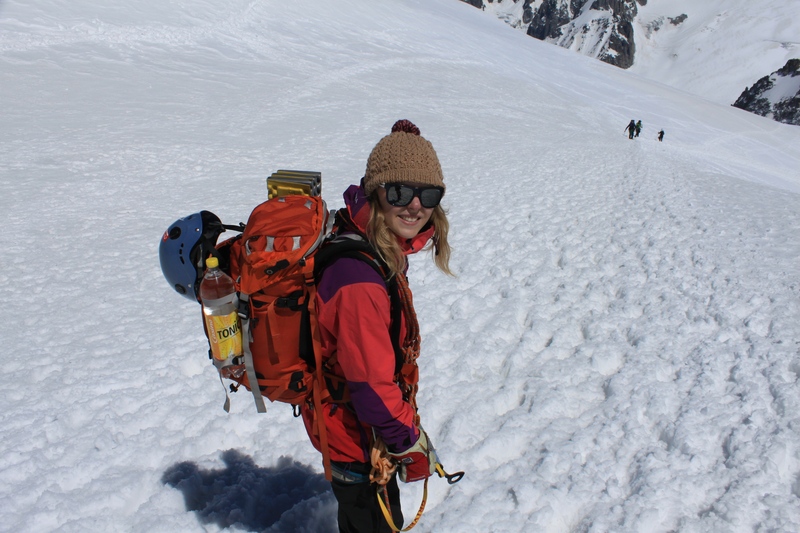 With the Coffee brewing we got ready for our return to the AIguille du Midi top station via the Cosmiques Arete. 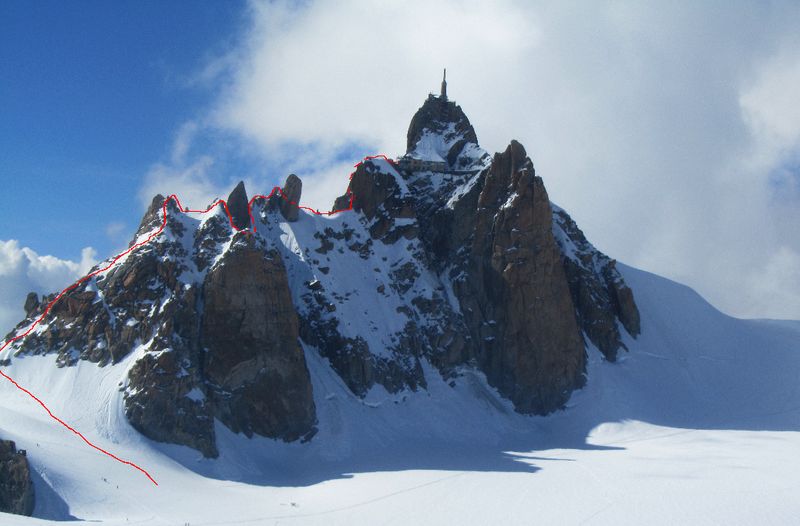 I climbed this route for the first time last week with Owen so had a good idea of what was in store for us. We left the hut by 7:15 so that we had a good hour head start on anyone coming up from the valley. 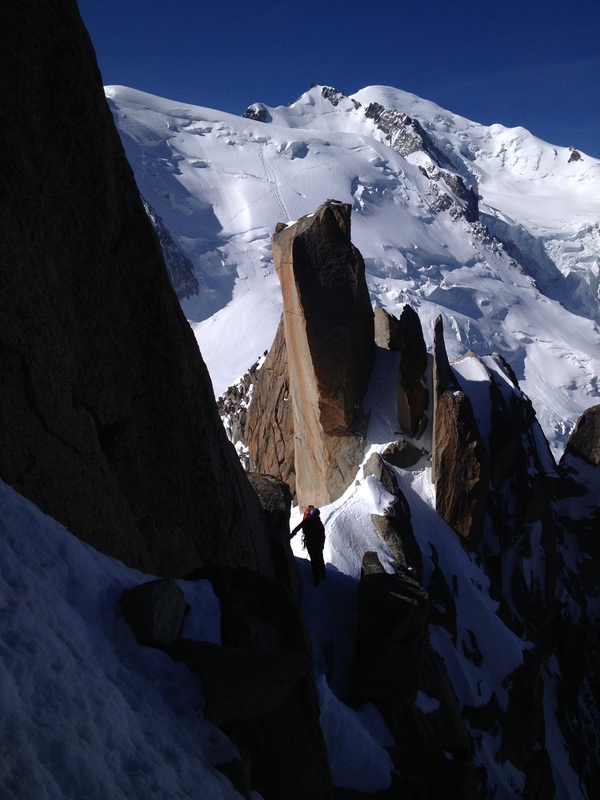 The Cosmiques route was very similar to lasts weeks with a few changes, snowfall over the weekend changed the route slightly. 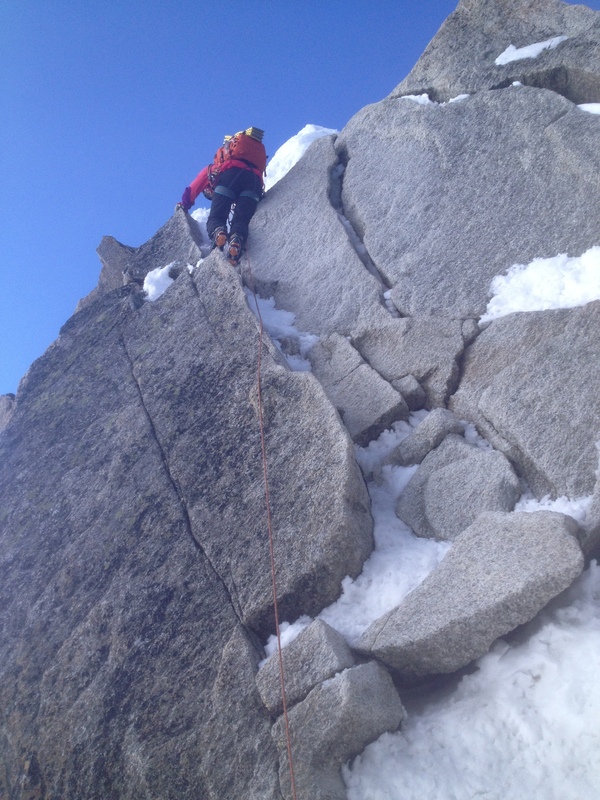 After the initial snow and rock ridge we opted to down climb the first rappel as it was well filled in with snow, this took about the same time as if we had rapped but was good fun. Katsu down climbing the first rock step. 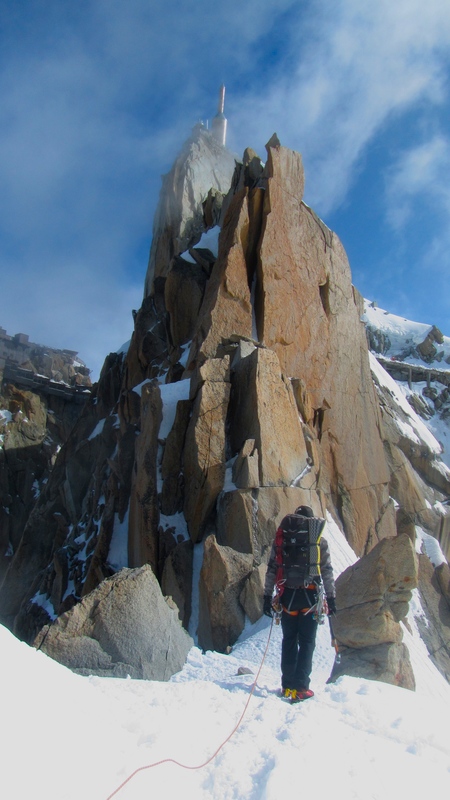 At the second Gendarme we took a different route over one of the rock spines which had a couple of trickier rock moves in and was a nice variation of the traditional route. Approaching the final rock towards the viewing platform. 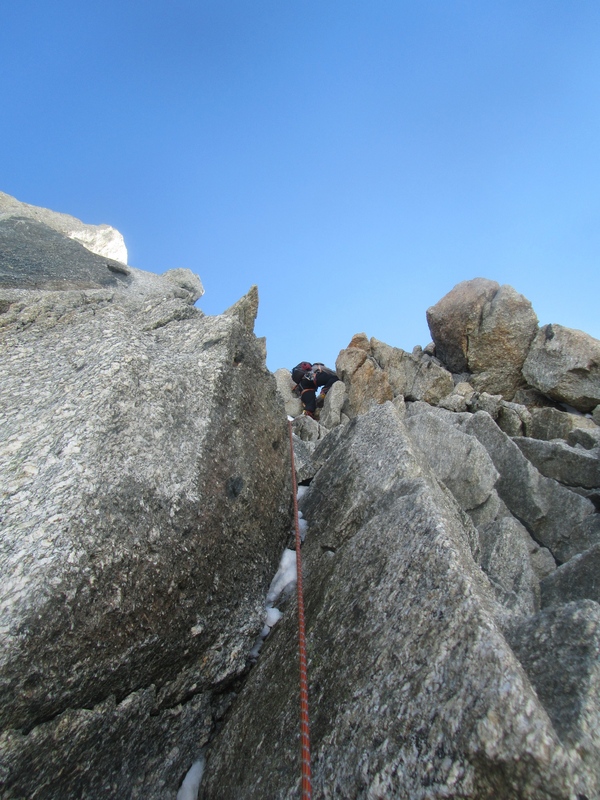 There is a small 3m rock climb to get to some bolts for a nice belay up the south chimney. As we were approaching the final chimney one person who was off first bin climbing solo was approaching us but this is the only time we saw anyone on the whole route. The final exit chimney is classic, not too hard but it feels very exposed as you look all the way down to the Cunningham Couloir. I flew up it with Katsu belaying and just below the top she started to follow for the easy first section before I reached the top bolts to set up a belay. 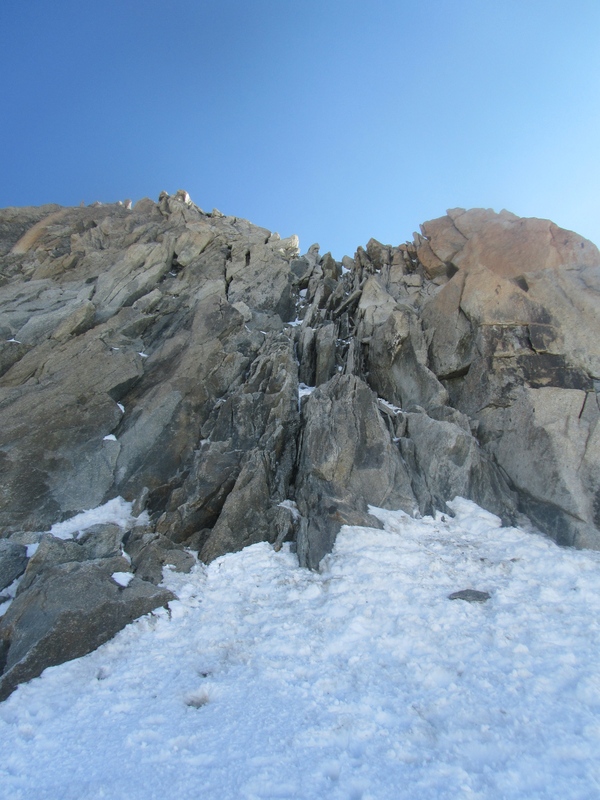 Finally on to the viewing platform of the Aiguille du Midi and we were done, very tired, hot and hungry. Catching the cable car back to town Katsu was very happy with her first Alpine adventure and I was pleased that it went without any difficulties. A great 26 hours in the Mountains and a big thanks to John Vincent and Katariina Maatta.